The Hokkaido wolf or the Canis lupus hattai, formerly known as Canis lupus rex, was also known as the Ezo wolf or Ezoookami. It was classified as a subspecies of the gray wolf in 1931 by Japanese arachnologist Kyukichi Kishida. Hokkaido wolves are descendants from mainland Siberian wolves. They once inhabited the Japanese island of Hokkaido, Russia's island of Sakhalin and Kamchatka Peninsula, and the Kuril islands. As compared to the Honshu Wolf, the Hokkaido Wolf more closely related to the standard gray wolf in size, dimensions, and other characteristics. They were usually a light grey or tannish grey in color. The Hokkaido Wolf fed mainly on deer, rabbits, and birds. A large number of deer starved to death in 1878 because of a heavy snow, having a great negative affect on the Ezo Wolf. In addition, the wolves were deliberately poisoned with strychnine by farmers who viewed the wolf as a threat to their livestock. 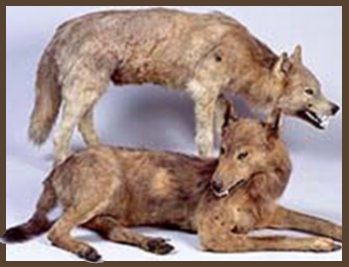 A bounty was placed on the wolf which officially became extinct in 1889. 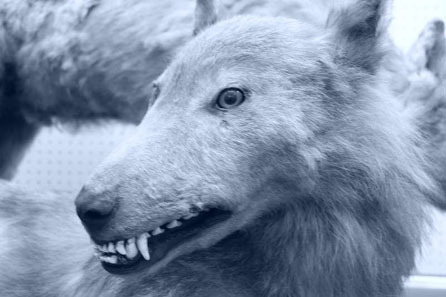 Since then, there have been people claiming to see the Ezo Wolf. However, none of these sightings have been verified.